Mark 11:15-19 – Selling in the Temple? Von Wahlde, however, points out that Sanders may be correct for normal times in the Temple service, but during Passover such a huge number of sacrifices were required that it is possible that booths were allowed in the court of the Gentiles in order to handle the crowds. None of the Gospels imply that the whole Gentile court was given over to the selling of animals. Perhaps a larger area was open for sales during the Passover, at other times sales were prohibited. Either way, for the most part these sellers were providing a service most people found helpful. I have never really questioned why Jesus drove away those who were selling things in the temple. Like P. Long said, you can reason that maybe the selling of doves and other animals could be helpful for those who have long trips to the temple. However, Jesus was obviously very upset with them evidenced by him overturning tables. Mark 11:17 says, “And as he taught them, he said, ‘Is it not written: My house will be called a house of prayer for all nations? But you have made it a ‘den of robbers'”. This idea of a house of prayer comes from Isaiah 56:7. This is how the temple ought to be. However, the temple was not always described as a ‘house of prayer’. The phrase ‘den of robbers’ comes from Jeremiah 7:11. In context, this passage condemns those who murder, commit adultery and perjury, worship and follow other gods. These people then go to the temple and try to say that they are safe. I think this shows the idea of a people worshiping other gods while still trying to worship God in the temple. Perhaps they used the temple and sacrifices there as a way to excuse themselves for all of the sinful things they had done. Perhaps that is why the money changers and sellers were doing in the temple. If they were abusing the system of sacrifices in the temple, it would make sense that Jesus would call it a ‘den of robbers’. Deuteronomy 14:24-25 makes plain that the practice was for the worshiper to buy an animal when he or she got there: using money that the worshiper had obtained by selling a similar animal st home, before beginning the journey. I think your question should be changed to include those who bought in the temple as well. It is important to note that Jesus drove out the sellers, the money changers, and those who bought in the temple. He would not let anyone carry anything through the temple. It is easy to put the condemnation by Jesus on the money changers and sellers because of his use of the phrase “den of robbers”. We immediately associate it with money and possessions, thus the condemnation goes to those who were making money. I would say the condemnation goes to all three groups. He is saying “Is it not written, ‘My house shall be called a house of prayer for all the nations’? But you have made it a den of robbers.” I do not see it implied by the text to not include the buyers. I point this out to say that it has nothing to do with the service they are providing. I agree with P. Long that the money changers and sellers were providing a much needed service, especially to those who had a long distance to travel. I would propose that the condemnation has nothing to do with money and over charging for services, but everything to do with faith. Jesus’ problem with the sellers, money changers, and buyers was their faith. I get this from the two references Jesus makes in his condemnation. “Den of robbers” comes from Jeremiah 7 and “house of prayer for all the nations” comes from Isaiah 56. Neither of these passages have anything to do with money. As Josh points out, “condemns those who murder, commit adultery and perjury, worship and follow other gods. These people then go to the temple and try to say that they are safe.” This means that Jesus condemned the people of make these offerings then continue on in their wicked ways expecting that they are delivered. People were offering to God for personal gain and not faith, this was for the sellers, money changers, and buyers. Isaiah 56 praises the faith and obedience of foreigners. God’s temple was to be a house for the faithful and those who serve God both from Israel and the foreigner. The problem was that the people who were there were not faithful, serving God, or keeping the Lord’s commands. Instead, they were coming and making offerings to God at the temple for their own deliverance, then returning to their corrupt and wicked ways. Thus, they were making the “house of prayer for all nations” into a “den of robbers”. 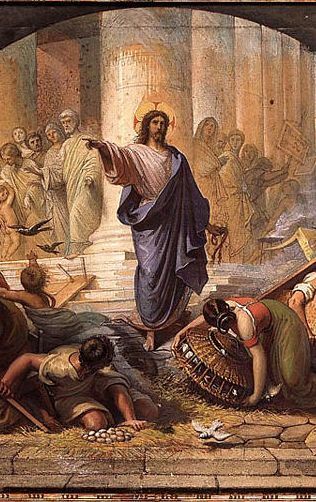 I think the reason why Jesus was not pleased with the things that were being sold in the Temple was because the Temple was probably not made for selling things like food and other items. The Temple was made more for prayer and worship to God. The fact that the people were selling things, it could have been an option that the people were becoming more interested in the things they were selling or how much they could sell them for instead of the main focus of the Temple and the people there – to worship God together and to have fellowship as well as a time of prayer. Now, if this were the case, I would totally understand why Jesus was not pleased with the situation that had occurred. It would be so sad to see the Temple, what was supposed to be dedicated to honoring God, had become into this flee market and the main focus was this market. If I were in Jesus’ situation, I would definitely have a problem with the money changers and the sellers. When I think of buying and selling in the Temple, I always compare it to someone coming into a church and trying to sell books or clothing. It seems like it’s beneficial to a ministry or to the church, but at the same time it completely takes away from church and the purpose of coming to build community and relationships by building others up through worship and study of the bible. I understand how back then they needed to sell oxen and sheep for sacrifice so it was important to do that, but in the temple? Why would being in the temple benefit anyone, it should be done in the neighborhoods and surrounding towns and whatnot as a respectful thing for God. In my view, God looks at the heart not the gift. So even though people try to buy the best that they can to give to God their best, it all starts with the heart. And if someone’s heart is so deceiving that they chose to sell in the foyer of the temple, they are not truly thinking of God and how important His house is and how important He is. This is just my opinion. Here’s my thought. Some people obviously choose to or lived near enough to bring their own animals. These animals needed to be without blemish and the priests were the ones inspecting the animals to decided whether or not they were clean. The priest then were also probably at least in a small way a part of the sell of these pre-inspected animals. Is it possible then that the priests doing the inspection could create a way to find a blemish on any animal they inspected? Thus forcing the owner of that animal to buy one of the ones sold in the temple courts leading to profits for the priests. That would be reason for Jesus to be upset and to call the place a den of robbers. I think that Jesus was upset because the Temple was a place of prayer and worship that is mentioned in Mark 11. In our notes, Professor Long mentioned that the Temple was a place for sacrifice and that played an important part of the practice of religion in Jerusalem. The temple is obviously an important place. Other religions during Jesus day did sacrifices to but Jewish sacrifice were different. Maybe this is a stretch but Israel was told to follow God’s commandment and they were to be different from other nations. Did other places of sacrifice include money changers and sellers? Whether they did or didn’t Jesus thought that they were disrespecting the Temple and were people were suppose to go to pray and worship God. I think that is a good enough reason for Jesus to get upset if they were changing the Temple. The Temple was not meant to become a place where money changers and seller in a sense “hung out.” The Temple was a place were people could come to praise God and do give sacrifice to God. I agree with Josh in that I have not ever questioned why Jesus drove out those who were buying and selling there. Although this may have been helpful to many it was not done in the correct way. Jesus tells the people that they have made His temple a den of robbers. This causes me to wonder if they were maybe being unfair in their dealings as well. Because people had to travel so far to Jerusalem they would be more likely to pay a higher cost for a ram rather then return home just to make the trip all over again. However, when “the chief priests and the teachers of the law heard this (they) began looking for a way to kill him, for they feared him, because the whole crowd was amazed at his teaching,” (Mark 11:18). I find it interesting that no body really seems to fight Jesus on this. It seems like maybe the people knew that what they were doing was wrong and were angry that they had to rebuttal. Tyler is on to something here. I agree that the service the vendors were offering was helpful and needed. When Jesus says, “Den of Robbers,” I most definitely think He is implying their desire for own personal gain. They are not thinking about the people they are selling to. They do not look at this as some sort of ministry for those who want to serve the Lord. They are viewing this as a way to make money for themselves. This is why, I believe, Jesus had a problem. Many try and relate this passage to the modern church. Some claim this is why large churches should not sell coffee or Christian literature. Well, if it was for someone’s own personal gain I would agree, but what if the money was going to help the church fund ministry projects? No one would fight that, right? See, I don’t necessarily believe this was a matter of selling vs. not selling it was a matter of their hearts and intentions. A large part of the problem is that we are possibly missing the point or purpose in Jesus’ actions here in the Temple all together. What purpose does this expression serve? It seems quite unlike Jesus’ normal character. Why the sudden rage and frustration that he is usually portrayed with? I think Wright has a great deal of valuable information to add to this overall picture. Wright would point out, and rightly so, that much of what Jesus did was for the expression of his Messianic vocation. And there is a possibility that the driving force behind Jesus’ actions was the goal of fulfilling messianic expectations and prophecies. Like Judas “The Hammer,” perhaps this is solely Jesus cleansing the Temple. I say that in order to emphasize the messianic vision and purpose of Christ; not to dismiss the notion that Jesus was indeed upset. I’m sure that is a great deal of his motivation, but despite his emotional state, I think Jesus understood this as in important plot point in the story of Israel’s redemption and his Kingdom ministry. I think Jesus had an issue because they were trying to make a profit in his temple. They were also taking advantage of the system by trying to sell sacrificial animals in the temple were there was sacrifices. It is like people who stand outside of stadiums and try to sell tickets to people. It is a quick buck and a scam of the system. It would be frustrating to see someone doing this, especially in a place of holiness. Everything had become corrupt. I don’t think that it matters what the profit was that the sellers were making was. I think it was more the fact that there were people who were taking the sacrificial system that God had given to Israel, and making it into a business. This was a service that was always required, as people never stop sinning, and required atonement for those sins. I don’t imagine that someone who was too poor had much luck coming to the temple and asking for a free pigeon to atone for his sins. The sacrificial system God had given to His people had become a money making business, that which catered to those who were able to pay. This was the way that people reconciled their sins before God, and it had become a money making business. This is not the way God had ever intended it. It brings to mind the idea of indulgences in the early church, that Martin Luther made it a point to stand up against. Or “preachers” getting rich off of preaching on TV and asking for donations for their cause. Or the stories of pastors who are arrested for embezzling money from their churches. I’m pretty sure God is never happy when we use the gospel, or people’s faith as a means for our own financial gain. I think this coupled with the fact that all of this was going on in the temple itself, drove Jesus to his breaking point. I for one love this imagine of Jesus, righteously filled with rage for how man can take something from God and distort it, and in that completely disrespect God. Jesus is so full of love for sinners, but he is shown here standing up and speaking out against something he sees wrong with Israel. God’s people, who should understand, love and follow God the most, are continuously the ones that Jesus gets mad at. I believe a big portion of this stems from the hearts of not only the vendors but also those buying the animals. Why sell the animals in the Temple itself? What purpose does it serve to desecrate the Temple with animals that may have been unclean? One point brought up earlier in the posts was about the priests being the ones who probably checked the animals. I cannot imagine them wanting to check every animal to make sure it was clean. As well, I wonder is a portion of the people coming to the temple to make sacrifices, did this act because a great deal of people were doing this and they figured “why not?couldn’t hurt.” Also the hearts of the vendors. These people may have jacked the price of the animals calling some better than others. (Just a thought/joke) Could it be that they said “buy this ox, and you will get a better blessing compared to buying this one.” I believe that Christ saw a “den of robbers” not only in their heart, but robbers in the blessings of Christ. They were doing such things, not in spite of Jesus, but just to go with the crowd, they could have been lazy, or because it was a good way to make a quick/great, buck. I have to wonder if this is again Jesus trying to get through to them that it is about the heart, not the specific action. Jesus says in verse 17, “My house will be called a house of prayer…but you have made it a den of robbers”. Here He is quoting both Isaiah and Jeremiah. I wonder of the people were so worried about making sure there was room and plenty of animals for all the people who would have been coming for the Passover event, that they were willing to do what was necessary to accommodate for them. But Jesus is all about the heart and relationships. So maybe He became angry because the people, once again, had turned something ‘good’ into something that just became a ritual and something that had to be done. It was something that was set up with good intentions, as a way to help people who lived further away, but it became so focused on that, that they may have forgotten where they were and the purpose behind the sacrifices and the importance of the temple and what it represented. He was most angry because they had made a place that was supposed to be for prayer they had made it into a “den of robbers,” (Matthew 21:13). Also as recorded in John 2:16, Jesus says not to make His Father’s house into a house of trade. The simple fact being that this was not a place for such behavior. I think another possible reason that Jesus saw this act as a great offense is because he saw the motive behind the sellers. It makes sense that the act of selling animals for sacrifice would be a good thing for the people coming to the Temple, but why were the sellers selling? Their motive may not have been to help out the people in need of a sacrifice. Their main motive was probably money; that they could make a huge profit, especially during Passover. Their motive seems to be more greed, then help, or else I do not see why Jesus would be so angry about it. I also believe that he may have been talking directly about the sacrificing itself. As through this act, he alludes to the end of sacrificial offerings all together with his death, burial, and resurrection (Strauss, 309). He’s the only sacrifice that is worthy. They don’t know God because they don’t know him. He’s the only sacrifice that is worthy they do not know God because they do not know him. Wouldn’t you be mad. I think they may have been Levites. Since only the priest could say if the animal was worthy. If so there was no way anyone could bring an exceptional sacrifice. It would have made the sacrifice like blackmail. I want to understand, but I can only if the Holy Spirit shows me. The problem Jesus had was with the corrupt system that was being used. The jewish leaders regarded using a Roman coin with the image of the emperor to be used in the temple as sacrilegious. Therefore the Romans allowed a temple coin to be used in transactions at the temple. The jewish leaders controlled the rate of exchange, and used it to create enormous wealth for themselves. The purchase of a lamb for a sacrifice was legitimate, but using it to essentially rob people was what aroused Christs wrath. The buyers and sellers we’re denying access to the poor to be healed! When Jesus clean out the Temple, the word of God says; And the blind and the lame came to him in the temple; and he healed them. Thanks to the person that posted this. I began by questioning why were there people selling in the temple. You answered that question for me! So, I believe it was about the spiritual principle behind it. They had lost the spiritual significance of the Passover and were trying to make it as streamlined as possible by making it easy to get hold of an animal. They were also making money out of it! This is a huge theme in John’s gospel. It is not natural for us, as physical being to understand the spirit of GOD. So, in order to know the spirit of GOD, we must be “born again” and start from scratch. When we see the wind blow outside, we cannot see it, but we can see the leaves rustle on the trees. So, as we live our lives guided by the spirit, people who see us will not understand why we do what we do, but they will see the things that we do. What we do is an indicator to the spirit of GOD inside us. I think the exodus tabernacle is a good reference to how Gods people were to conduct themselves in his holy place. First there had to be a sacrifice outside the tent(Holy place), then cleansing of water laver, then the priest entered the Holy place of prayer. No one would have entered any other way, for the fear of Gods wrath upon them! Also 1 Timothy 6:10 says For the love of money is the root of all evil, Judas sold Jesus for thirty pieces of silver. Doves sacrificed were a representation of what he did for us on the cross, the money changers regard was for the love of money not the temple, or God, But I’m so thankful that Jesus died on the cross of Calvary for the love of man! John 10:6 thru 11 brings it all together,verse 9 says I am the door: by me if any man enter in, he shall be saved, and shall go in and out and find pasture. Always enter the door of his tabernacle undefiled, which the dove in most scriptures represented being undefiled, Doves stay faithful to one another for life, and Jesus has always been faithful to me! I have failed him, but May the lord help me to be faithful to him! John 14:15 says If ye love me, keep my commandments. The day of the week we worship, is a day of rest, and a day to keep holy, and to be set apart. We know to do this, but why? Because one day there will be an eternal day of worship, rest, and holy ness unto him where there will be no sin! It will be worth it all when we see Jesus!!!! !